What I like about this dish is it could be served hot with extra Parmesan cheese on the side. It could also be served warm or cold as a pasta salad course for lunch. The original recipe was something I wanted to try as written but the day I planned to make it was when I had other unexpected errands to run, leaving little time to spend in the kitchen for dinner. I adapted the recipe so it's something that takes no time at all to prepare. Once I get home from work, one of the first things I do is change into pajamas. When I made this dish, I came home, cooked up the pasta while I changed. By the time my pajamas were on, the pasta was ready to be drained and tossed with everything else. Voila - dinner is ready! In a large pot over high heat, add water and salt; bring to a boil. Add the pasta and stir as needed, cooking until the pasta is al dente, about 8 minutes. Transfer pasta to a bowl and toss with a 1/2 tablespoon of olive oil. 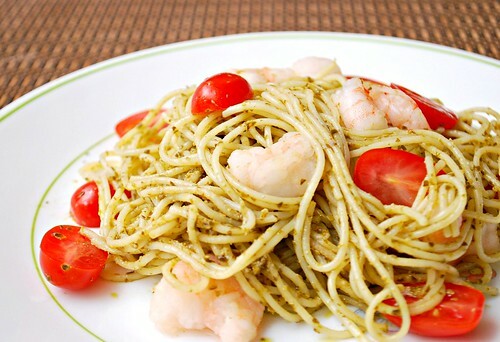 Add the pesto to the bowl and toss to coat the pasta. Add shrimp and tomatoes, tossing to combine and serve with extra grated parmesan cheese. Garnish with fresh basil if desired. 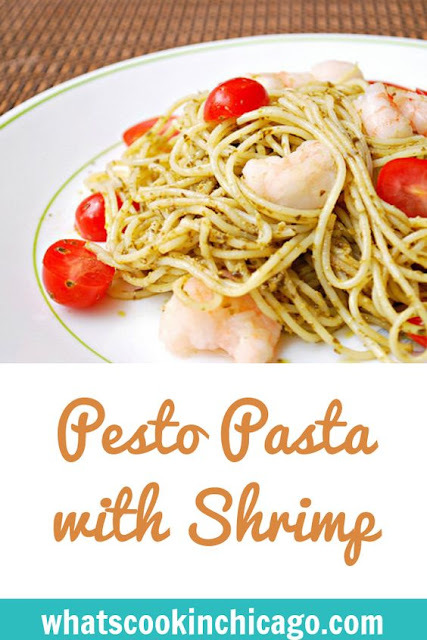 What a perfect simple and fast dish! I was trying to think of what to make tomorrow night, since I don't eat meat on Fridays during Lent. This is perfect. Just found your blog! This looks delicious! Thanks for sharing! I would like to make this soon, what do you do with the one cup if reserved pasta water? I can't figure that out! Thanks.